Coruscant is the center of the Star Wars galaxy, but that doesn’t mean it’s a bastion of safety. While politicians squabble in the top layers of the city planet, in the undercity far away from the eyes of the Emperor, tactical combat rages on! 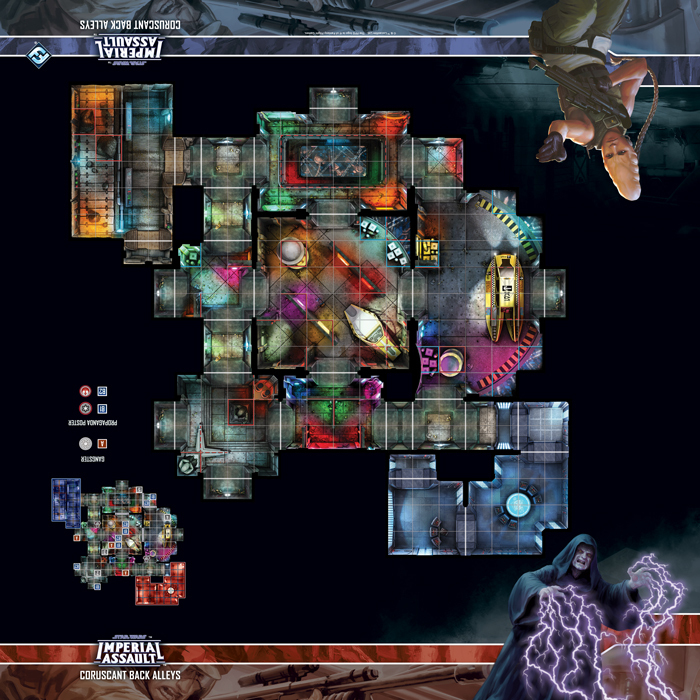 Fantasy Flight Games is proud to announce the Coruscant Back Alleys Skirmish Map for Imperial Assault, available now for pre-order from your local retailer! The Coruscant Back Alleys Skirmish Map is a 26” x 26” slip-resistant mat for use in your Imperial Assault skirmish games, making setup quick and allowing you to jump right into the action with a pre-constructed map. This skirmish map takes your battles to the neon-soaked back alleys of Coruscant, where dark corners and narrow passageways make for tight-quarters combat. The skirmish cards included with the mat add new twists to your games. 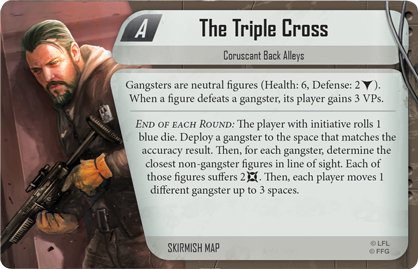 The Triple Cross sees you and your opponent dealing with neutral gangsters in the back alleys, scoring points for defeating them while they do damage to every character in sight. 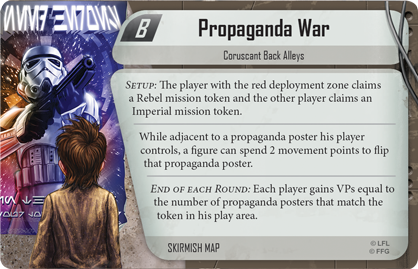 Meanwhile, Propaganda War sees players defending and placing propaganda posters, trying to recruit citizens to the cause of the Rebel Alliance or the Galactic Empire while trying to undermine your opponent. Regardless of your mission, the Coruscant Back Alleys Skirmish Map is a unique battlefield that sees classic Star Wars battles rendered in the neon glow of Coruscant, and lets you defeat your opponent in style. Take your battle to the center of the galaxy with the Coruscant Back Alleys Skirmish Map (SWI61), available now for pre-order from your local retailer!